Let’s say you’ve just laid out an enormous amount of money for that house or condo with the spectacular view. 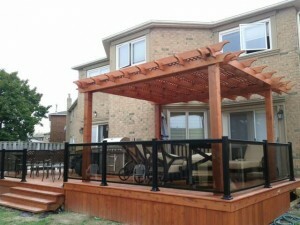 Do you want that view blocked by the railing around your balcony or deck? Of course not. So what’s a homeowner to do? If you’re like an increasing number of folks in the GTA you’re turning to glass railings to open things up and restore that incredible view. The Ultimate Windbreaker – As mentioned earlier the #1 reason to install deck glass railings in Toronto is to preserve your beautiful view. But keep in mind that glass railings can also act as an excellent windbreaker allowing you to enjoy the view from your deck or balcony without your food being blown away. Create a Contemporary Look – Whether adorning the perimeter of your balcony, deck or your open plan stairway, glass provides an unmistakably modern touch. When integrated into an overall home design, glass railings can be the element that brings the entire look together. Two-Way Backyard Security – Adding a glass railing around your inground pool will provide you with an important layer of security from the outside. It will also allow you to keep an eye on the kids while they’re in the pool at the same time. A win-win situation for sure. Enhanced Curb Appeal – Installing glass railings in Toronto around your deck or pool area will add an immediate “wow” factor to the look of your home. This increased curb appeal can add thousands to the value of your house while also ensuring it will sell faster should you ever decide to part with it. Deck glass railings in Toronto are rapidly gaining in popularity due to their many aesthetic and practical advantages. Preserve the view, hold back the wind and add a touch of contemporary class to your home with stunning glass railings from RJ Aluminum Railings. Call us on 416 887 7069 to learn more about how glass railings can add both visual and bottom line value to your home or business.